GCC 2016 application is now open! 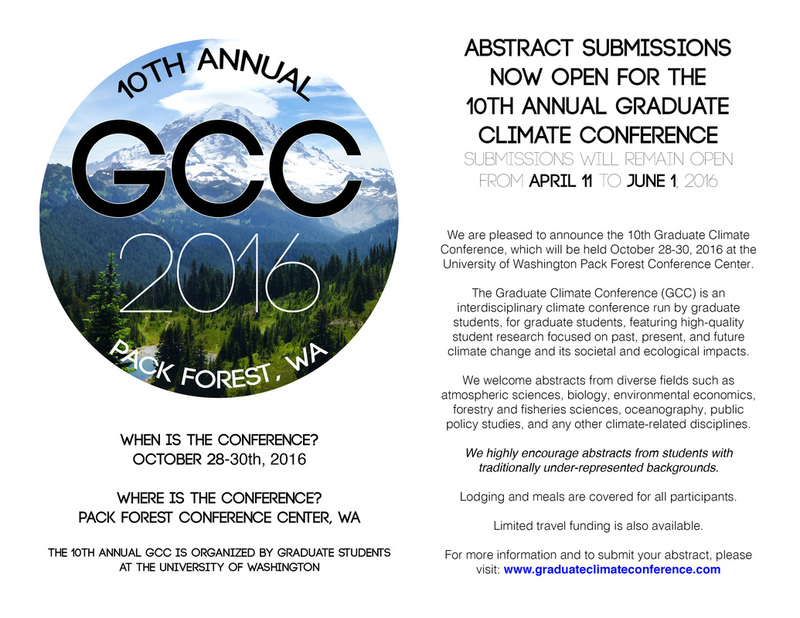 The 10th Annual Graduate Climate Conference (GCC) is now accepting applications! Please visit the "application" tab of our website for instructions and to apply. 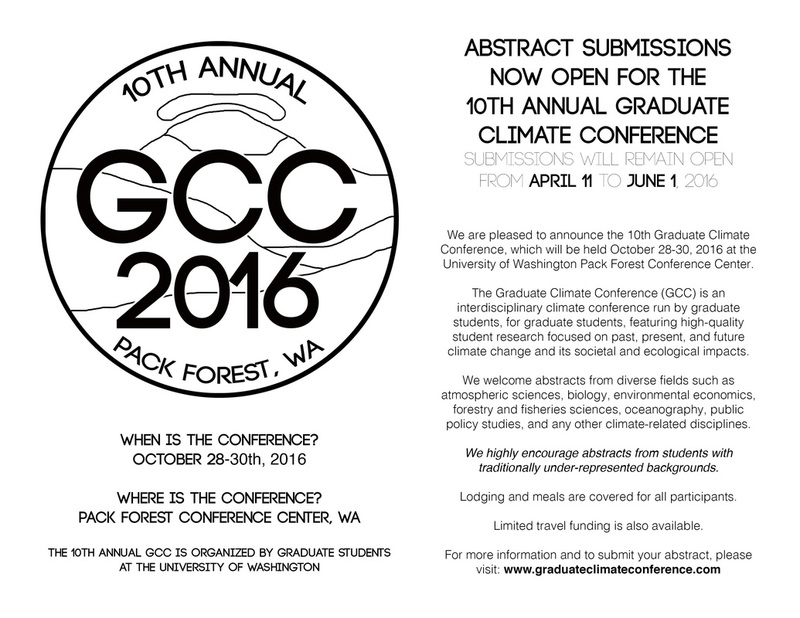 GCC 2016 will be held October 28-30, 2016 at the University of Washington Pack Forest Conference Center. The GCC is an interdisciplinary climate conference run by graduate students, for graduate students, with the goal of assembling a broad range of talks and posters featuring high-quality research focused on past, present, and future climate change and its impacts. We encourage students at all stages of their graduate career to apply and we seek abstracts on climate research from a variety of disciplines from the physical, natural, and social sciences and humanities, including: anthropology, atmospheric sciences, biology, Earth and environmental sciences, economics, engineering, ethics, geography, law, oceanography, public policy, and resource management. We highly encourage abstracts from students with traditionally under-represented backgrounds. The abstract submission period closes June 1. Lodging and meals are covered for all participants, and limited travel funding is also available. ​Please feel free to distribute the fliers below to graduate students at your institution. Planning is underway for the 2016 GCC. Come back to the website Monday, April 11th 2016 to apply! Presentation details: all GCC attendees either give an oral presentation or present a poster. There are a limited number of oral presentation slots available. The application period will close Wednesday, June 1st 2016.